Stars of The Grand Song, a film featuring Guizhou province's Dong ethnic group made an appearance on the red carpet of the closing ceremony of the 6th Beijing International Film Festival on April 23. Authorities and event organizers in the Guizhou capital of Guiyang are making final preparations to host the 2016 International Big Data Expo from May 25 to 29. A 60-year-old villager in Suiyang county, Guizhou province guided 30 explorers and scientists from China and France through a network of caves in Suiyang Shuanghe Hole National Geological Park on April 23. Guiyang resident Wang Chunying has a passion for music, and despite his long years still tours China in musical groups and bands. 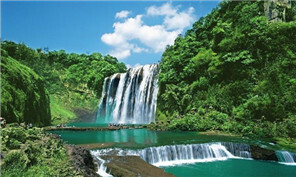 The Cultural Center of Inchon in South Korea displayed more than 200 photographic works featuring colorful Guizhou province on April 21-26. Guiyang Longdengbao International Airport's official WeChat account "Guiyang Airport Company" is part of the airport company's drive to build a big data platform to better serve the passengers. 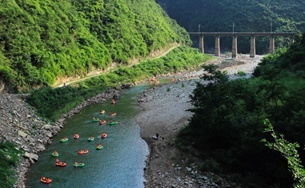 The whitewater excitement is set to go roaring The fast-paced, bare-knuckled, whitewater excitement is set to go roaring downstream once more in Guizhou in May.